Ryan Giggs says walking out of the Old Trafford tunnel as Manchester United manager was the "best feeling" of his 27 years at the club. The player manager, in temporary charge after David Moyes was sacked on Tuesday, enjoyed a 4-0 win over Norwich City on his debut as a manager. The club is the rock which my life has been built upon and I promise to give this job the best I can. 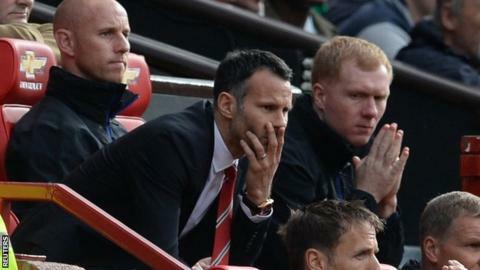 "All the years I walked out at Old Trafford, I've never felt like that," said Giggs, 40. "I felt 10 feet tall. "I enjoyed it and 4-0 is a dream day for us so I'm really pleased." Giggs, who joined United as a 14-year-old in 1987, had promised a return to an exciting brand of football and to put smiles back on faces after a "frustrating" season. He made six changes to the team which lost at Everton last weekend and his side responded with 11 shots on target - more than in any previous league game this season - as two goals apiece from Wayne Rooney and Juan Mata sealed a comfortable win. "Obviously I was happy we were 1-0 up at half-time but not particularly with the performance," said Giggs, who used his programme notes to "promise" to give the job his best efforts. "I said to the players they had trained hard, maybe too hard, and it's been an emotional week. I reminded them we play with speed and tempo and when we do, not many can live with us. They reacted well to that." Despite the comfortable success, the United boss dodged questions on holding any long-term hopes of landing the job on a permanent basis, instead saying he "was focused on Sunderland" - their next opponents. After coming off the bench, Juan Mata completed 96.2% of his passes, 93.3% in the opposition half - the highest accuracy of any United player. The Welshman admitted he found it difficult to drop players, but praised a "masterclass" by Mata, who played the last half an hour after coming off the bench. United trail sixth-placed Tottenham by six points with one game in hand, but are resigned to falling short of 70 points for the first time since 1991. "All of us have let ourselves down this year, we haven't played to the quality we are capable of but we did that this afternoon," added Giggs. "The standards they set here, they need to keep for Sunderland. "I think every player has a point to prove. Only David de Gea has performed to his ability this season. The rest have fallen below those standards. "It's not about playing one good game. Every time you put a United top on you have to keep to those standards."